For 14CO2 and 14CH4 determinations, dissolved gas (d-gas) and dissolved inorganic carbon (d-dic) samples were ran on Oxidation Line I, and bag samples were processed on Oxidation Line II. Both oxidation lines first trap CO2 in NaOH, oxidize residual CH4 to CO2 in an 800 ºC oven, then trap the CH4-derived CO2 in a 2nd NaOH solution (Whalen and Reebugh 1990). All scint vials from the oxidation lines were filled with 4mL of NaOH sample and 12mL of Scintiverse II cocktail. Solutions are then analyzed for 14C by a Beckman™ LS3801 Liquid Scintillation Counter (LSC). Using soil sampling needles and a 60 mL syringe, we pulled 40 mL of bubble-free water out of the ground. We then pulled 20 mL of ambient air and vigorously shook the syringe for 2-3 minutes. After the shaking period, the gases in the headspace should be in equilibrium with the dissolved gas content. We transfered ~10-15 mL of the headspace air into a nylong, airtight syringe (Kling et al. 2000). 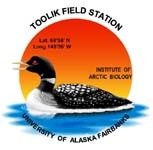 The syringes were returned to the laboratory at the Toolik Field Station and were ran on the oxidation line. After the gas samples were analyzed, we expelled all air and bubbles from the water syringe to a standard volume of 38mL. The remaining water was acidified with 0.5 mL of 0.2N HCl through the stopcock, which converts DIC to Carbon Dioxide. We then added nitrogen gas headspace to 60 ml, and shook vigorously to equilibrate the headspace and DIC content (Stainton 1973). We split the headspace gas – 8 ml to a syringe for the GC (CO2 only); and the remainder to the oxidation line. Using soil sampling needles and a 60 mL syringe, we pulled 40 mL of water out of the ground and filtered it through a Whatman GF/F filter (0.7μm pore size, nominal). At the laboratory, we pipetted 4 mL of the pore water and 12 mL of Scintiverse scint cocktail into a scint vial. We shook the solutions for 2 minutes on a shaker table, and then put the vial onto the LSC to determine the concentration of labeled DOC. scint cocktail and 14CO2 and 14CH4 were measured by LSC. After a flux measurement, we allowed the CO2 concentrations to build-up in the head space of the soil collars for 40 minutes. We evacuated a butyl stopper sealed glass serum vial with a hand vaccuum pump. We then added 15 mL of Carbo-sorb through the septum. We took a 120 mL gas sample from the soil collar and injected/bubbled it into the Carbo-sorb. Upon returning to the TFS lab, we transfered 10mL by syringe of the Carbo-Sorb into 10mL of Permafluor scint cocktail in a scint vial. The 14CO2 was determined by LSC. Shaver, G.R. and F.S. Chapin. 1991. Production - biomass relationships and elemental cycling in contrasting arctic vegetation types. Ecological Monographs 61(1): 1-31. Whalen S.C. and W.S. Reeburgh. 1990. Consumption o f atmospheric methane by tundra soils. Nature 346:160-162.